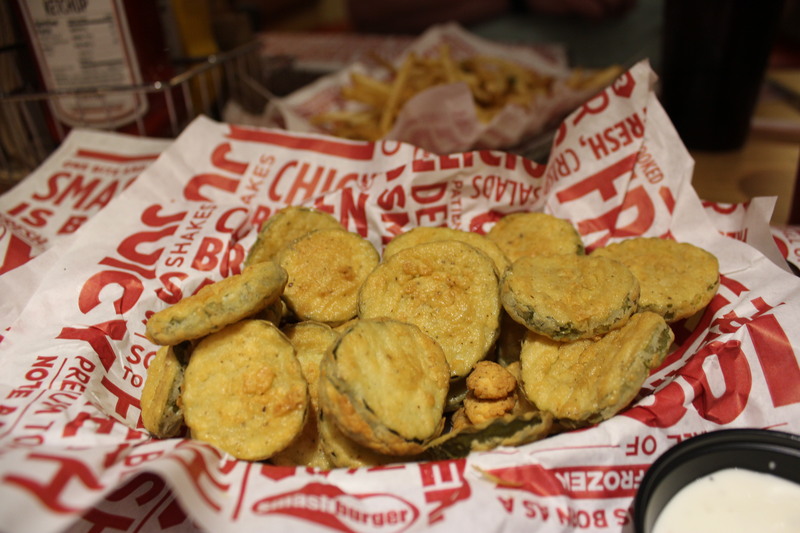 For those of you who follow this blog, you may recall my post earlier this year about Smashburger’s debut in Durham. 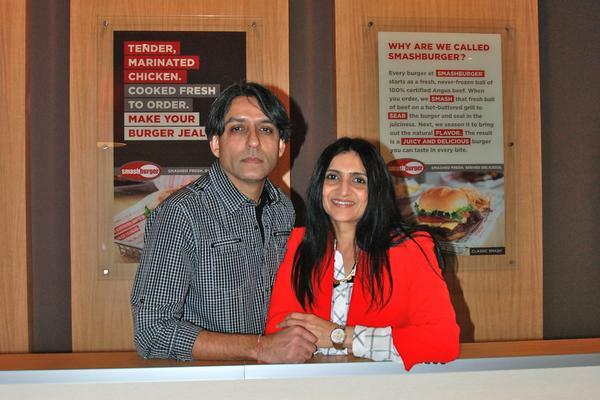 In that post I wished that owners Ketan and Jayshri Patel would open a location in Raleigh, and I’m thrilled to say my wish is coming true this Wednesday, 12/17/14, as Smashburger comes to Fall Village Shopping Center on the corner of Falls of the Neuse and Sandy Forks Roads. I was lucky to be invited to the media event at this new Smashburger location, and this time Brad was able to come with me, and looking forward to it. When we arrived, we were greeted by Jayshri, who remembered me from the Durham Smashburger’s media event. In fact, she told me later in the evening that she had placed a framed copy of my blog post in the window of the Durham location, which made me feel so special! 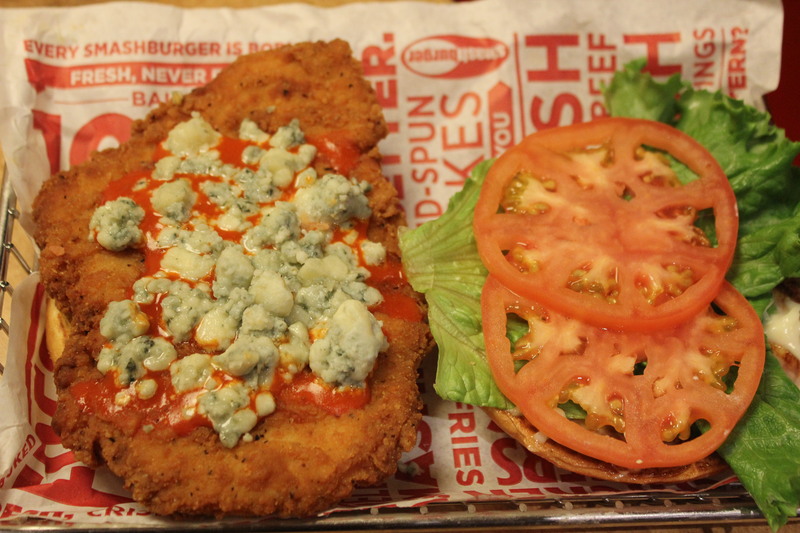 Another new item I tried was the SmashChicken® with Buffalo & Blue Cheese. This was crispy chicken breast topped with Frank’s® Red Hot Buffalo Sauce, blue cheese crumbles, lettuce, tomato & mayo on an egg bun. Spicy good, but not too hot. Loved the bleu cheese crumbles. It was Brad’s favorite of the two chicken sandwiches we sampled. 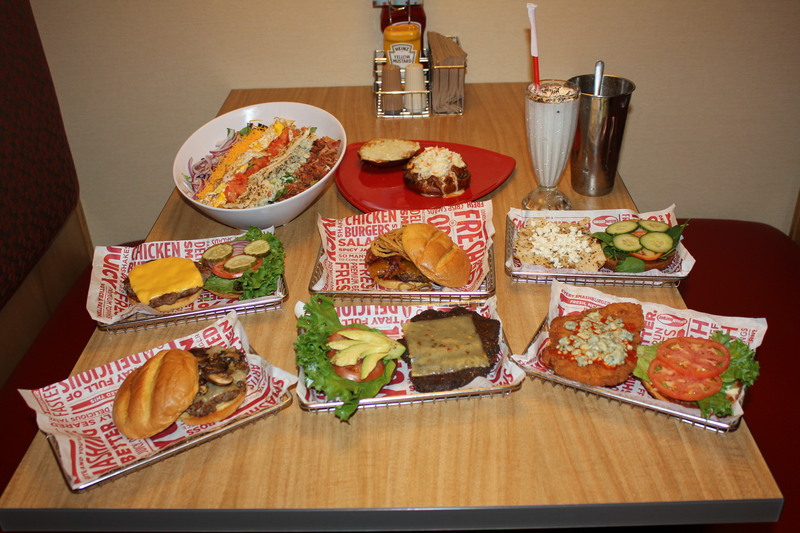 We also tried the Classic Smashburger; BBQ, Bacon & Cheddar burger; Truffle Mushroom Swiss burger, the “local” Carolina Chili burger; Avocado Ranch Black Bean burger; and the Spinach Cucumber & Goat Cheese burger, which you can read about in detail on my previous Smashburger post. Brad’s favorite was the BBQ, Bacon & Cheddar burger, while I love the messy Carolina Chili burger. I had one of these at the Durham location last month and eventually wound up eating it with a fork. That’s OK since it’s so delicious! 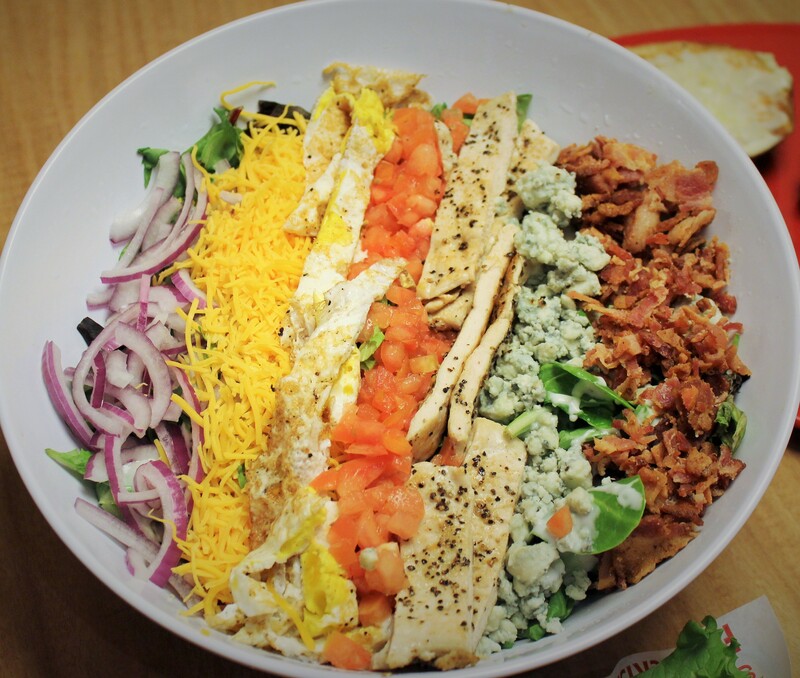 However, next time I go to Smashburger, I am going to try this awesome-looking Classic Cobb salad. It is served in a huge bowl and consists of fresh greens, bleu cheese, fried egg, bacon, tomatoes, onions and cheddar cheese with buttermilk ranch dressing. All this freshness for only $5.99. Are you kidding me? What a bargain! 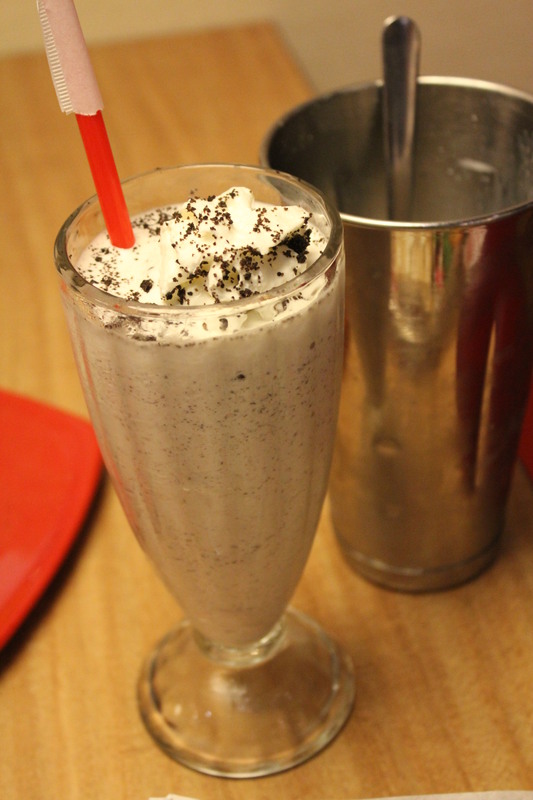 We saved room to test a couple of the hand-spun shakes that are made with Häagen-Dazs® ice cream. Brad chose chocolate, which was yummy and almost as good as the salted caramel shake that I wolfed down. 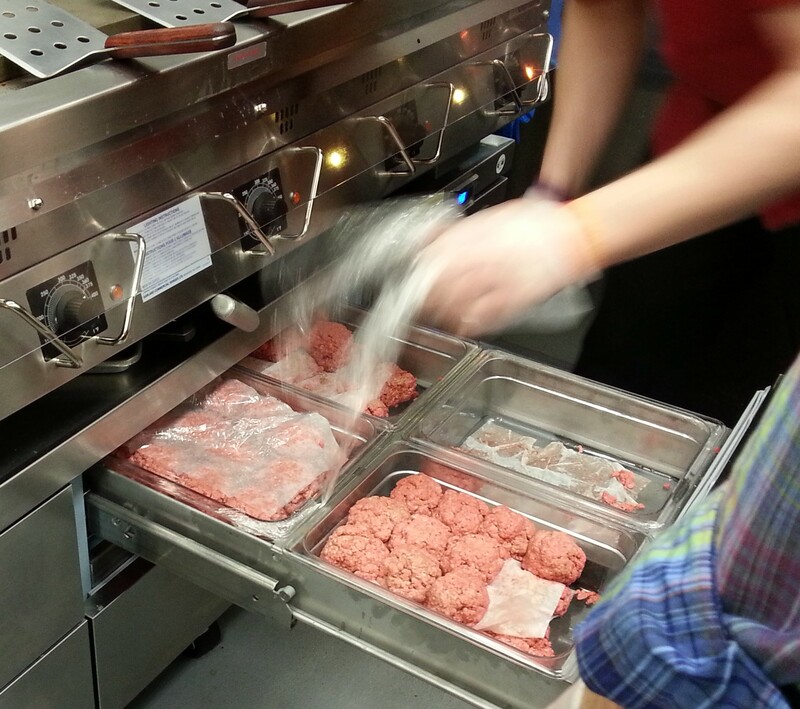 Burgers at Smashburger start as fresh (never frozen) balls of all natural 100% certified Angus Beef. 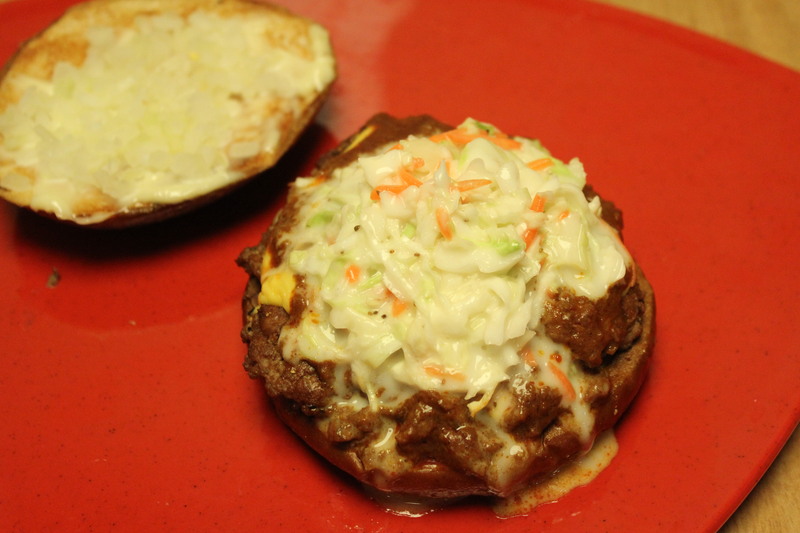 They are smashed on a hot, buttered grill to sear the burgers and seal in the juices, and then sprinkled with special seasonings. Delicious! I wish Ketan and Jayshri continued success in this business. What a delightful, caring couple who love food and their customers as well as giving back to the community. From Raleigh’s grand opening on Wed., 12/17/14, through Friday, 12/19/14, 10% of the total proceeds will help the nonprofit Communities in Schools of Wake County, a dropout prevention agency that helps students in need. So come on out on opening day to enjoy the food, participate in fun onsite activities (including a snow machine on the back patio), have a chance to win some tasty giveaways throughout the day, and donate to an excellent cause. 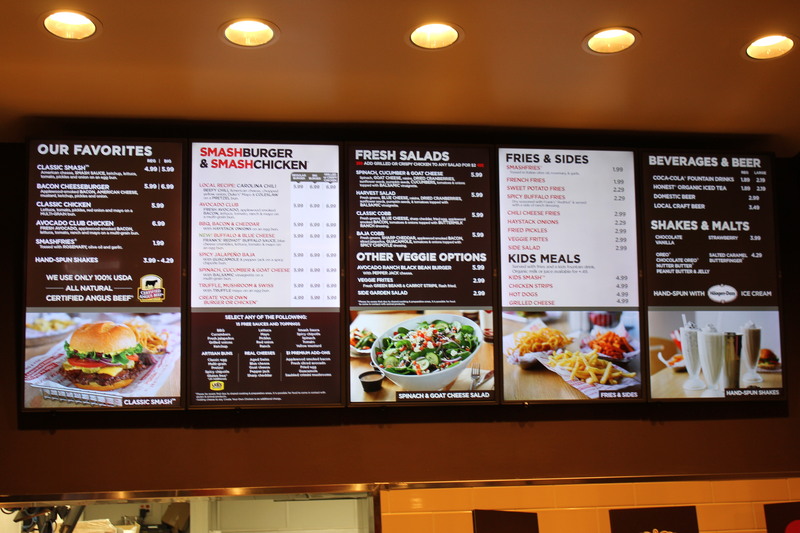 This entry was posted in Restaurant Reviews and tagged eat drink and be merry, Kel's Cafe restaurant reviews, Ketan and Jayshri Patel Smashburger, Restaurant Reviews Raleigh NC, Smashburger Raleigh NC, Smashburger review. Bookmark the permalink.